Happy Friday! Here at Taylored Expressions we're gearing up for the next big release in just over a week, with sneak peeks beginning next Thursday. Saturday, September 5th is Release Day and you'll want to tune in right here to the SASI Blog where we have a huge party planned to celebrate the 1st Birthday of Cuppie and TE Stamps. We'll have lots of fun challenges and prizes galore, so mark your calendars and plan to play! Today we want to introduce you to Our Friday Friend Lisa Hjulberg (known on SCS as TheCraft’sMeow). Lisa's yummy cherry card jumped out of the gallery at us and we're excited to have her play along in Taylor's Sketch Challenge this week. We asked Lisa a few questions to get to know her better. 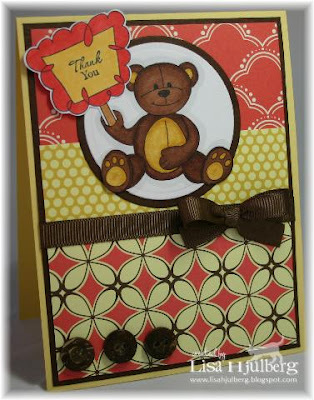 Lisa's card today features Beary Special (partial proceeds from this set will be donated to the Sick Kids Foundation if purchased by August 31st) and you can read more about this card on Lisa's blog The Craft's Meow. If you'd like to play along with today's sketch challenge you can get all the details on Taylor's blog. I first became addicted to scrapbooking when a friend asked me to host a Creative Memories workshop about 10 years ago. I was immediately smitten. Not long afterwards, my nail lady had a Stampin’ Up catalog at her station one day when I was getting my nails done. The moment I started flipping through that book, I was hooked without ever having inked up a stamp! I became a Stampin Up Demonstrator 6 years ago, mainly as a hobbiest. My passion for stamping has grown stronger every year. I still scrapbook, but I spend most of my crafting time stamping. I’m not sure how to describe my style. I gravitate mainly towards whimsical outline images that I can color, and I tend to use lots of color. I love colors, especially deep or vibrant colors, and a clean look. My favorite stamped projects are cards. That’s a hard one because I truly love them all! But if I had to narrow it down, I’d have to say the Whimsical Wishes line has got me hooked, especially Berries & Cherries and Branching Out (and Coordinates). I have nearly all of the sets in this stamp line. I’m also totally hooked on the Key Ingredients Kits. They make it so easy to create a beautiful card in no time, and the value is awesome! Thank you Lisa for being Our Friday Friend! What about you? Would you like to be featured here as Our Friday Friend? To be considered simply upload your TE creations to your gallery at SplitCoastStampers using the keyword tayloredexpressions (no spaces). We check the gallery often and we're looking for you! For more sweet inspiration click here to go to the Taylored Expressions Gallery on SCS. Congrats Lisa! I love your card and am so happy to see you on the SASI blog! Gorgeous work you do! Love this teddy bear... so cute with his little ole sign. Congrats, Lisa. You are a beautiful Friday Friend! what a super sweet card Lisa made! congrats on being our Friday Friend!! What a great card Lisa! Love the colors, the DP, the cute bear and the coloring! Fab job on the sketch. TFS! Congrats Lisa! Your card is absolutely adorable. I love his yellow tummy, feet and ears, and that perfect bow! That is one good looking card! I love the geometric shapes and the color combo. Iris Soscia.